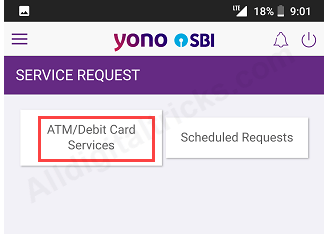 Dear SBI (State Bank of India) customers, now you can apply (request) for a new ATM Debit card through SBI YONO application which available on Android & iOS platform. Applying new debit card facility also available on Internet banking. 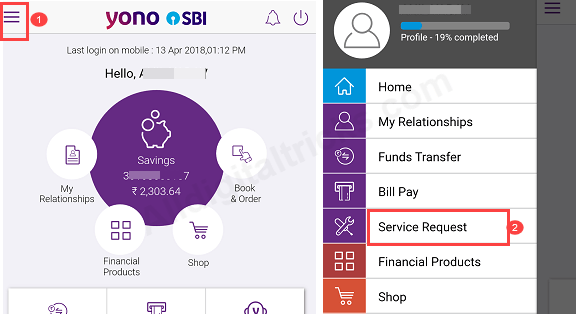 SBI YONO (You Only Need One) is new banking application launched by SBI last year. You can manage your bank account, apply for a new saving account and manage all services on this application. To use SBI YONO, you just need SBI internet banking facility. Using your net banking credentials you can register on SBI YONO. 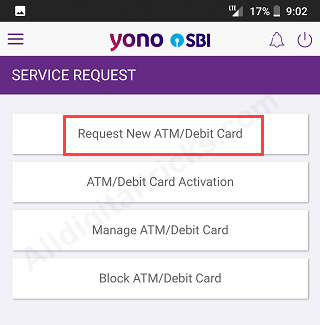 Now see how you can request new ATM Debit card on SBI YONO. After successful registration on YONO, login using MPIN or net banking user id and password. 1: To request a new card, tap & open option bar and select Service Request as you can see below screenshot. 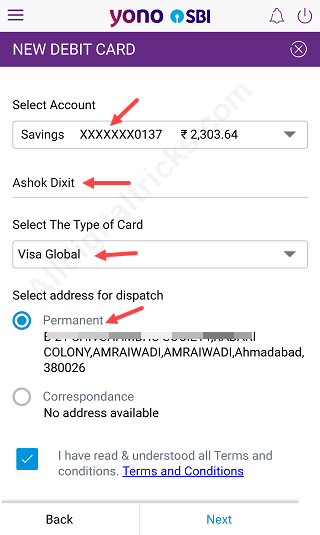 2: On Service Request, you can see ATM/Debit card Services option, tap on it. You need to enter profile password. 3: Next screen, tap on Request New ATM/Debit Card. 4: Now select your account number, enter your name which you want to print on card, select your card type (you can select VISA or mastercard). Select your delivery address and submit your request. 5: Next screen you need to enter One Time Password which sent on your registered mobile number, enter OTP and confirm your request. That’s it your new ATM Debit card request has been sent successfully. Wait for 15 days it will be delivered at your home address depend on your location. There is no option to track your card, depend on your location it will be delivered on your location within 15-20 days. After receiving your card you can can activate your card and generate PIN through net banking, no need to visit bank for physical pin or activation. 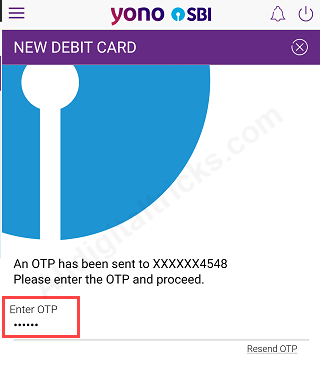 So this is how SBI customers can apply for new ATM Debit card through SBI YONO application, no need to visit bank.